Welcome to Tropicultura website Terms and Conditions (“Terms”). www.tropicultura.com (“Tropicultura”, “we”, “us” or “our”) provides the services available on this website (“Website”). Please read these Terms carefully as by using any part of this Website, including completing any customer registration with us and/or placing any order on the Website, you will be deemed to have understood and agreed to be bound by these Terms. If you do not agree with these Terms, then you must cease use of this Website immediately. These Terms are a contract between us and you may wish to print a copy for future reference. For the avoidance of doubt, please note that each time you access this Website (for whatever reason), you will be deemed to have accepted these Terms. We may revise these Terms at any time by updating this posting. You should, therefore, check this Website from time to time to review the then-current Terms to ensure that you are at all times fully aware of our current Terms. Any changes are effective immediately upon posting to the Website. Tropicultura is the trading name of www.tropicultura.com a website registered to Miriam Jubehova Tiborova 74540537K whose registered office is situated at Camino Pataura S/N, Motril, C.P. 18600, Spain. Email Address: info@tropicultura.com Telephone number: +34 689 863 980 . “Website” refers to any of the websites owned and operated by Tropicultura including but not restricted to www.tropicultura.com or any subsequent URL which may replace it. “Goods” means the articles supplied and displayed for sale on the Website. “Buyer”, “user”, “you” refers to you as a customer who is placing an order with Real Foods or you as a user of this Website. 1.2 Further, you hereby represent and warrant that the personal information, which you are required to provide when you register as a customer is true, accurate and current in all respects. It is your responsibility to inform us of any changes to that information (including your e-mail address) by contacting us, through our contact form or contact info noted above. 1.4 You are responsible for all use of the Website made by you and for preventing unauthorised use of your username and password. If you believe there has been any breach of security such as the disclosure, theft or unauthorised use of your username and password, please notify us immediately. 1.5 If following registration with the Website you decide that you no longer wish to remain registered with the Website you may cancel your registration by sending notice of cancellation to our email. 1.6 Without limiting our other remedies, we may immediately issue a warning, suspend or terminate your subscription, use or access to this Website and refuse to provide our services to you without notice to you: (a) if you breach any of these Terms or warranties or any documents incorporated by reference or; (b) if we are unable to verify or authenticate any information that you provide to us during the course of any applicable registration or; (c) if we believe that your actions may cause legal liability for you, our users (registered or otherwise) or us. Upload, post, e-mail, transmit, distribute or otherwise publish any message, information, text or other material that Real Foods deems to be unlawful, libellous, pornographic, harassing, racially, ethnically or otherwise objectionable. Upload or transmit any material that would constitute or encourage a criminal offence or violate the rights of any party. Upload, e-mail, transmit, or otherwise make available any material that might infringe any patent, trademark, trade secret, copyright, or intellectual property of any party. 2.1 We are committed to protecting your privacy. We use industry-standard security to safeguard the confidentiality and storage of your personally identifiable information in accordance with current EU Data Protection legislation and guidelines, however, please be aware that “perfect security” does not exist on the internet. Further, it remains each user’s responsibility to safeguard against unauthorised access to their user details, to ensure that only the user logs on to the Website and to ensure that the user logs off from the Website when not using it and to keep his/her log-in details safe. 2.2 You can access our Website homepage and browse this Website without disclosing your personal data. 2.3 When you shop on this Website, we will ask you to input and will collect personal Information from you such as your name, e-mail address, billing address, delivery address, telephone number, product selections, credit card or other payment information and a password. where applicable, we may, by law, be forced to disclose certain information to government or law enforcement agencies. Therefore, although we take every effort to protect your privacy, you should not expect that your personally identifiable information or private communications will always remain private. if you consent, to notify you of new products or special offers that we think you will find of interest. 2.5 You will only receive promotional information from us if you opt in by ticking the appropriate box as you go through the registration process. You can unsubscribe from our contact list at any time by e-mailing or telephoning us. We will then make sure your personal information is deleted from our mailing list and databases in accordance with our administrative policies (e.g. for example, we may be required to retain your address details in relation to any credit card purchase for a period of not less than 6 months). 2.6 If you would like to check the details we hold about you please do not hesitate to contact us. We will be happy to review and update, amend or delete your records as necessary. 2.7 We can provide you with a readable copy of the personal information which we keep about you within 30 working days, although we will require proof of your identity and any such request for personal information must be received by us in writing. 2.8 If we wish to use your personal data for new purposes, we will offer you the means to consent to these new purposes by either indicating your consent at the point on the website where the data is collected or by communicating with us by email. 2.9 We never pass, disclose or sell our customers’ personal details to any marketing lists. 2.10 We may be monitoring customer traffic patterns and Website usage so that we can learn about how people are using the Website and how we can improve our service. This can include the use of a “cookie”. Cookies are small text files that are sent to your browser and stored on your computer’s hard disc. If you wish, you can modify your browser to prevent this happening. Please note however that by disabling cookies, this may impair your experience of our Website. 2.11 We do not knowingly collect personal data from children. We do not sell products for purchase by children. Any children’s products sold are intended for purchase by adults. By accepting these Terms, you confirm that you are over 18. 2.13 If all (or substantially all) of our assets which are used to operate our business are acquired by a third party, then your personal information may be transferred to that third party. 2.14 Personal data may be transferred worldwide. 3.1 We have taken steps to ensure the security and privacy of our systems and our user’s data and personal information. Our Website uses secure payment system, which offers all of the security measures you would expect as dealing with a major bank. At checkout you are transferred via a secure server to the payment gateway server, a 128bit SSL encrypted secure page where you complete your order by providing your credit card details. Systems which encrypt potentially sensitive information by Secure Sockets Layer (SSL) technology provide the best possible protection on the internet. You can identify that you are on a secure site when the padlock appears in your internet browser. 3.2 All card details are encrypted using 128-bit encryption; they are not held in clear text on any Website. When you choose to pay online, your card details will not be available to Tropicultura staff staff. Your card details are input into the payment gateway secure site and we do not have access to them at any time. Your card and address details are security checked and verified with the relevant card issuer and your payment is pre-authorised. 3.3 We are not liable for any unauthorised, erroneous or denied payments. 4.1 You place your order by clicking on the submit order button at the end of the online order process. You will be guided through the process of placing an order by a series of simple instructions on the Website. 4.2 Once you have placed your order, we will send to you an acknowledgement email detailing the Goods that you have ordered, a payment reference and the value of your order which will be debited from your credit/debit card. 4.3 Unless we have notified you that we are not able to accept your order or you have cancelled your order in accordance with the Cancellation and Returns Procedures set out below, our acceptance of your order and the completion of the contract between you and us will take place at the time and date that we notify you by e-mail that we have despatched the Goods ordered by you. The deemed time and date of receipt by you shall apply regardless of whether, for reasons outside our control, you have not received that email. 4.4 You will be sent an invoice together with the Goods ordered. This invoice also acts as a receipt. Due to weather conditions we are not able to collect the fruits. 4.6 If we are unable to fulfil your order following our order acknowledgement (i.e. in relation to any non-acceptance of an order), we will contact you by email or telephone to advise you of this as soon as possible. You will be given a full refund of what you have paid in relation to any such non-fulfilled order. 4.7 Gift Wrapping: We do not currently offer a gift wrapping service online. 4.8 Sending direct to gift recipient: The postage and packing charge includes 1 delivery, either to you or your recipient. 4.9 It is your responsibility to ensure the delivery address is accurately conveyed, accessible to couriers and suitable for parcel delivery. We cannot accept orders with delivery addresses to PO Boxes or Post Offices. If the parcel is returned due to errors in the address by the customer, we reserve the right to retain payment for courier services. 4.10 We require a minimum of 24 hours’ notice before the parcel is dispatched to make any changes to an order. 5.1 The price of the Goods shall be the price quoted on the Website on the date of acceptance of the order by us. If we find a pricing error on our Website we will inform you as soon as possible and give you the opportunity, if you wish, of reconfirming your order at the correct price or cancelling it. If you cancel and you have paid for the Goods, you will be given a full refund. For the avoidance of doubt, we are neither bound nor liable in any way to provide Goods to you on the basis of any pricing error (obvious or otherwise) found or posted on our Website. 5.2 All prices indicated for products available via the Website are inclusive of VAT (where applicable) at the currently applicable rate. 5.3 The price of the Goods includes delivery to Spain Peninsula addresses, delivery to other EU countries are calculated and updated in your cart once all details of your orders are introduced. You will pay the delivery charges by the method specified in your order for transport and packaging as quoted on the Website on the date of acceptance of the order. 5.4 Price and availability information is subject to change without prior notice. 6.1 Payment of the price of an order must be received by us and cleared before despatch of your Goods. 6.2 We accept MasterCard, Visa, Maestro debit and credit cards for online payment. All transactions are in Euros (€). If paying by credit or debit card, please advise us of the billing address your provider holds on file. You confirm that the credit or debit card that is being used is yours. We cannot be liable for any unauthorised transactions nor can we be held liable for any denied payments which are a result of the information provided by you. 6.3 We also accept payment through paypal and direct bank money transfer. 6.4 All credit/debit cardholders are subject to validation checks and authorisation by the card issuer. If the issuer of your payment card refuses to, or subsequently refuses to, or does not, for any reason, authorise payment to us, we will contact the cardholder to advise. However, we shall not be responsible for any costs or inconvenience caused by a subsequent delay, denial or payment or subsequent non-delivery of any Goods on the basis of the above. 7.1 Our fruits are collected and dispatched every monday and wednesday of the week, subject to events that are beyond our reasonable control. 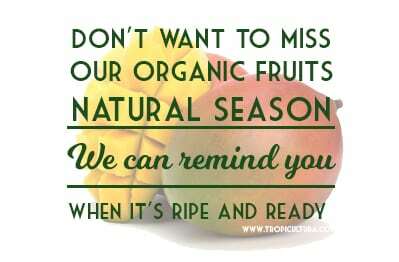 7.2 WE can only offer you fruits in their natural season. Dates of the beginning and end of each season are orientative and might vary every year. 7.3 We use ( next day before 20:00 courier service) in Spanish peninsula. DElivery might take from 4 to 5 working days to other EU destinations.we usually send our customers tracking details for their orders, if you do not receive that information, please do not hesitate to contact us. 7.4 Please note that we do not accept any liability whatsoever for any delay in delivery caused by third parties (including Royal Mail or any mailing or courier service companies) that we may use to deliver your order. 8.1 The method and address for delivery shall be as specified in your order. Parcels may require a signature on delivery. If you will not be at your home address during normal office hours, you may wish to give us an alternative delivery address, such as a work address. Please ensure we have the full address including your full postal code (PO Box addresses are not acceptable for delivery) and a contact telephone number. address any intended cancellation or complaint to the correct place of business. 8.4 On occasion, fresh items will be slightly damaged but still usable, we may organise a partial refund for these upon receipt of photographic evidence. We will only accept damage claims for fresh and perishable items within two days of receipt of the order. The delivery price quoted is an estimate only and in some instances, we may need to contact you. Please note that in some instances the online delivery estimate may be an over or underestimate of the true cost which will then be adjusted when the final order is quoted for by our hauliers. Further payment or refund as is appropriate may be required. 11.1 Risk of damage or loss of the Goods shall pass to you on delivery or, if you fail to take delivery of the Goods, at the time when the Goods are delivered (or delivery is attempted) to you in accordance with your instructions. 11.2 Title in the Goods shall pass to you upon delivery of the Goods and on our receipt of full payment. Legal ownership of the Goods will immediately revert to us if we refund any such payment to you or if the Goods are returned in accordance with any cancellation, refund, return or exchange policy as posted on this Website. 12.1 We cannot accept returns or exchanges of fresh items, refunds and re-dispatches can only be considered in the event of damaged or poor quality stock being received. If any item arrives damaged or defective, please contact us. 12.2 We will not accept any responsibility for loss or damage to Goods returned in this way until they are received at our address above. We strongly recommend that returns are sent by ‘recorded registered delivery’ and the original proof of posting is kept. Please note that we are not responsible for return postage other than for incorrectly supplied, defective or damaged Goods. Return postage for Goods returned for any other reason shall be solely at your cost. 12.3 If the courier has repeatedly attempted delivery with the customer and has returned goods to us after being unable to contact or re-arrange delivery. We reserve the right to deduct courier costs as appropriate. This does not apply to damaged parcels or incorrect goods. 12.8 If, for whatever reason, we are unable to source goods , the order will be cancelled and the customer notified. 13.1 You should inspect the Goods when you receive them for damage. 13.2 You should refuse to accept delivery of goods which are severely damaged and the courier will return the package to us. 13.3 If the damage is minor you should sign for the delivery clearly indicating that the goods are damaged. 13.4 Please contact us within 24 hours of delivery/attempted delivery to inform us of the problem. 14.1 We take all reasonable care to ensure that all details, descriptions and prices of products appearing on the Website are correct at the time when the relevant information was entered onto the system. However, although we aim to keep the Website as up to date as possible, we do not warrant that product descriptions, colours or other content available on the Website are accurate, complete, reliable, current, or error-free. We try to include as much information as we feel necessary for you to make an informed choice. The colours on your screen and any product descriptions should be used as a guide only. 14.2 In addition, due to the fact that the products are made of natural ingredients and components, slight variations may occur in actual Goods. All dimensions are approximate. 15.1 You acknowledge and agree that all intellectual property and other proprietary rights (including, but not limited to, copyright and trademarks) and all technical, business or similar information (including but not limited to, all designs, documents, photographs and other materials relating to the Goods) created by us (and or any applicable licensors) shall be, and shall remain our property (or the property of our licensors, as applicable). All design, text, graphics, layout, software and all other materials on this Website are protected by copyright, trademark and other proprietary rights and belongs to us (or our licensors, where applicable) and all such rights remain reserved. 15.2 We give no permission in respect of the reproduction or use for any purpose of any brand names, product names, designs or other material shown on this Website in which intellectual property rights subsist. Unless otherwise stated, users may view, print and download the contents for their own personal, non-commercial use only; the contents must not be used for commercial or business purposes or incorporated in any work or in any publication in any form without prior written permission from us or any applicable licensor or copyright owner. 15.3 By submitting any content data whatsoever including but not limited to recipe, review, image, video, comments and concepts to Tropicultura you hereby grant to Tropicultura an irrevocable, perpetual, worldwide, royalty-free right and license to use, display, publicly perform, modify, reproduce, publish, distribute, make derivative works of, sublicense, and otherwise commercially and non-commercially exploit your submitted Items and all copyright, trademark or other intellectual property rights therein without compensation of any kind to you or any third party. 15.4 You hereby warrant that you have all necessary right and authority to grant the license set forth herein to your submitted item and that your submitted Item does not violate or infringe any copyright, trade secret, trademark or other intellectual property rights of any third party. Publication or use of any submitted items is at the sole discretion of Tropicultura. 16.1 The Website is presented on an “as is” basis. We make no representations or warranties of any kind whatsoever, express or implied, in connection with these terms or the Website, including but not limited to warranties of satisfactory quality, non-infringement or fitness for a particular purpose, except to the extent that such representations and warranties are not excludable by law. The information displayed is of a general nature and is not intended to address your particular requirements or constituting any form of advice, recommendation or arrangement by us. 16.2 We make all reasonable efforts to ensure that the information on our Website is accurate and up-to-date. However, you should always independently check any information before you rely on it. We do not represent or warrant that the information accessible via this Website is accurate, complete or current and we do not accept liability for any loss whatsoever arising from any inaccuracy or information that is out of date. 16.3 In particular, you agree that, to the fullest extent permitted by applicable law and save in respect of death or personal injury arising from our negligence, neither us nor any of our parents, affiliates, subsidiaries, directors, employees, shareholders, agents or other representatives shall be responsible or liable under any circumstances, for any amount or kind of loss or damage that may result to you or a third party (including without limitation, any direct, indirect, punitive or consequential loss or damages), or any loss of income, profits, goodwill, data, contracts, use of money, or loss or damages arising from or connected in any way to business interruption, and whether in tort (including without limitation negligence), contract or otherwise in connection with your use of this Website and its services. 16.4 The limitation of liability noted at clause 16.3 above shall also be extended to include any use in connection with your use, inability to use or the results of use of this Website, any websites linked to this Website or the material on such websites, including but not limited to loss or damage due to viruses that may infect your computer equipment, software, data or other property on account of your access to, use of, or browsing this Website or your downloading of any material from this Website or any websites linked to this Website. Such limitation of liability shall also extend to any events beyond our reasonable control including any restricted or non-access to this Website due to service interruptions. 16.5 You agree to indemnify and hold us and (as applicable) our parents, subsidiaries, affiliates, officers, directors, agents, representatives, shareholders and employees harmless from any claim or demand, including any legal fees, made by any user (registered or otherwise) or third party due to or arising out of your breach of these Terms (including any documents incorporated by reference), your violation of any law or the rights of a third party or any breach of your representations and warranties as contained herein. 16.6 Although we accept that we are obliged to take every reasonable step to ensure the authenticity of your credit/debit card transactions, we are not held liable for any damage or loss due to any misuse by any other person of your credit or debit card details. 17.1 We are not responsible for the content of any off-Website pages or any other websites linked to or from the Website. Our Website may contain links to other internet sites operated by third parties. We may provide such links for your convenience only, and links from this Website to any other website do not imply that we approve of, endorse, or recommend that website. We assume no responsibility or liability for the actions, content, products, or services of such pages and websites, including, without limitation, their privacy statements and terms and conditions. Opinions expressed or material appearing on such websites are not necessarily shared or endorsed by us and we should not be regarded as the publisher of such opinions or material. 18.1 If you require any more information on our products or services, please e-mail us or call us at the contact details below. 18.2 We hope that you will be delighted by your shopping experience with us. However, if you are dissatisfied with a product or service provided by us, please contact us quoting your unique transaction number and provide us with the details and/or nature of the complaint. We will try to resolve your issue as quickly and easily as possible. 18.4 Any formal legal notices should be sent to us at the address provided above by registered post. Receipt of such notice shall be deemed to have taken place 2 working days after posting. Any formal legal notices that we send to you shall be sent to you by registered post at the last known address provided by you and receipt by you shall be deemed to have taken place 2 working days after posting. 19.1 You acknowledge and agree that these Terms constitute the complete and exclusive agreement between us concerning your use of the Website and any purchase by you of any Goods from us, and supersede and govern all prior proposals, agreements, or other communications. No variation of these Terms shall apply unless agreed in writing by us. 19.2 If any provision of these Terms is found to be unlawful, invalid or unenforceable in whole or in part by any court having competent jurisdiction, the invalid or unenforceable provision will be severed from these Terms, and the validity of the other provisions of these Terms and the remainder of the provision in question shall not be affected thereby and shall remain in full force and effect to the fullest extent permitted by law. 19.3 Nothing contained in these Terms shall be construed as creating any agency, partnership, or other forms of joint enterprise between us. 19.4 Due to our policy of updating and improving the Website, we may alter the content of this Website at any time. You shall not transfer, assign or sub-contract any obligations under these Terms without our prior consent in writing. 19.5 No failure to exercise and no delay on the part of either party in exercising any right, remedy, power or privilege of that party under these Terms and no course of dealing between the parties shall be construed or operate as a waiver thereof, nor shall any single or partial exercise of any right, remedy, power or privilege preclude any other or further exercise thereof or the exercise of any other right, remedy, power or privilege. The rights and remedies provided by these Terms are cumulative and are not exclusive of any rights or remedies provided by law. Time shall not be of the essence in relation to these Terms as regards to any of the times, dates and/or periods mentioned herein. 19.6 We may, with or without prior notice, terminate any of the rights granted by these Terms. You shall comply immediately with any termination or other notice, including, as applicable, by ceasing all use of the Website. 19.7 We reserve the right to refuse to supply Goods to any person for any reason whatsoever, to withdraw any Goods or offers from the Website at any time and/or remove or edit any materials or content on the Website. We will not be liable to you or any third party by reason of our withdrawing of any Goods or offers from this Website whether or not such Goods have been sold or such offers have been extended, removing or editing content on the Website or refusing to process a transaction or unwinding or suspending any transaction after such processing has begun. 19.8 Headings in these Terms are for convenience only and will have no legal meanings or effects. 19.9 If you have any questions regarding these Terms please contact us. 20.1 Tropicultura gift vouchers (GV) must be redeemed on the www.tropicultura.com website towards the purchase of eligible products listed in our online catalogue. 20.2 GVs cannot be used to pay for GVs. 20.3 GVs have no cash redemption value and are not transferable or assignable. Tropicultura.com may provide GV purchasers with information about the redemption status of GVs that they purchase. 20.5 If the order exceeds the amount of the GV, the balance must be paid by credit or debit card. 20.6 GVs and unused portions of GVs expire one year from the date of issue, where permissible under applicable law. 20.7 Tropicultura is not responsible if a GV is lost, stolen, destroyed or used without permission.